The next time you clamber aboard that big horse of yours for a ride, consider what he might have looked like 40 million years ago, give or take a million. A lot smaller, for one: his ears may have reached up to your waist; and he probably would have had three distinct toes on each foot. 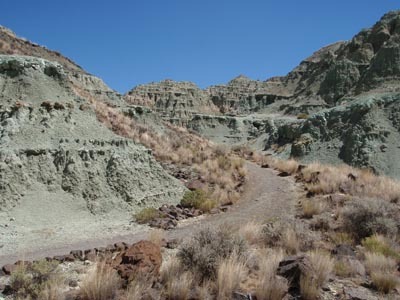 If you pass through the John Day Fossil Beds National Monument in central Oregon, you can see the resting place of fossilized remains of 2200 species of plants and animals from up to 54 million years ago, and visual evidence of climatic changes and the building and eroding of landscapes throughout the millennia. 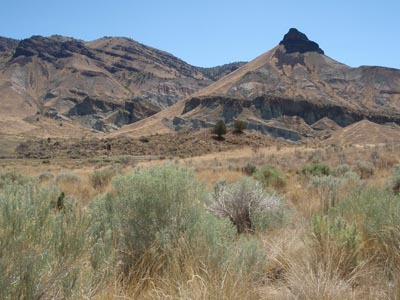 What was once a jungle, then a deciduous hardwood forest buried by layers of ash throughout millions of years, is now a semi-arid climate with a grassland/sagebrush vegetation, covering layers of basalt, volcanic tuffs and claystones. Water and wind slowly erode the layers to reveal clues about the past. 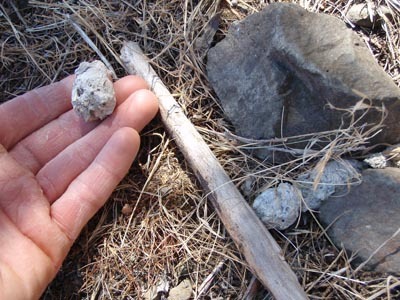 One of those species from the past is the horse; 14 genera have been found in the John Day Fossil Beds. 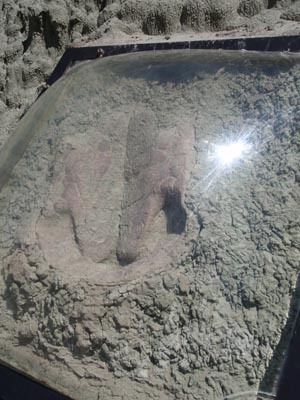 Two of those are the Haplohippus (40 million years ago), and the Miohippus - "Middle Horse" - (29 million years ago). In the visitor's center, you can see an actual jawbone from the 3-toed Miohippus, and a jawbone from the Haplohippus - one of only two in the world (the other was found in Texas). In the Miohippus, the middle toe was the primary one; the 2 other toes hit the ground only when running fast or jumping. In modern Equus, the 2 extra 'side toes' have become the splint bones. 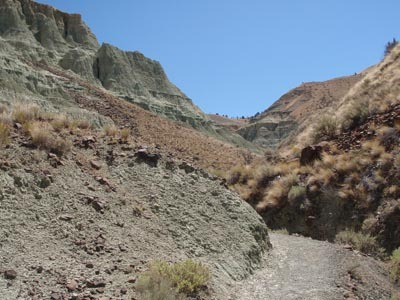 A short hike at Blue Basin in the Sheep Rock unit takes you through what used to be a hardwood forest, but is now a canyon of eroded blue-green claystone made from ash from volcanic activity throughout the millennia. 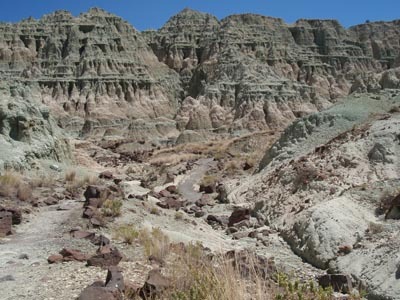 from 24-30 million years ago where they emerged as the volcanic sediments slowly wore away. They are covered in plexiglass cases, left as they were found. 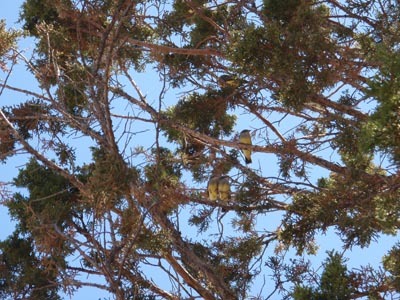 and a family of western kingbird siblings huddling together in the tree next to the owl tree. 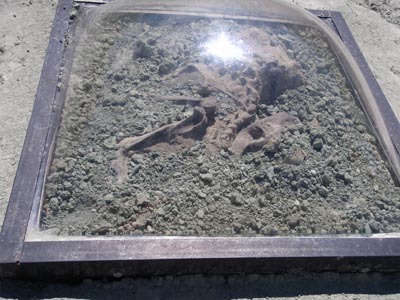 Their bones will eventually join the others - and in another 40 million years, give or take a million, some other beings might be digging us all out and trying to piece together our past. Wonder what size their horses will be then?